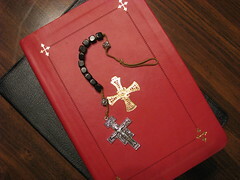 The Roman Catholic tradition has been one of a single book, the bloated ‘breviary’ (brief it ain’t!). Although, in some periods the Roman Office grew so complicated, that an ordo was needed to consult as to which office was to prayed at each hour. This is what Cranmer complained about as ‘Pie‘ in his introduction to the Book of Common Prayer. Over this last year, we have become acquainted with the Roman Office — Daily Prayer from The Divine Office — in my parish church. Its core is the psalter, which is arranged over a four-week cycle. For each of the 28 days in the cycle we get two psalms (or portions of psalms) and a canticle (OT in the morning, NT in the evening) every morning and evening, and a short scriptural reading of a few verses in length. This feels quite different from the Anglican tradition of reading two decent chunks of scripture and the reciting of most of the psalter over a certain time. However, The Divine Office is enriched with hymns. One hymn is provided for each Morning and Evening Prayer along with an appendix of hymns proper to seasons and saints. Also, each hour has a full set of intercessions, broad yet reflective, rather than the vague outlines and appended litanies we find in Anglican prayer books. With a few additional, pertinent petitions added to the end, these intercessions give the Roman Office a rich and easily accessible diet of prayer. Daily Prayer has an appendix of religious poetry, but one of the central psalmody’s pleasant aspects is its use of the Grail psalms, an English translation based on Joseph Gelineau’s concept of psalm recitation. Verses are often doubled up to make antiphonal recitation less like tennis (with a quick return at every verse), and the marked sprung or pulse rhythm emphasizes the regular count of strong stresses in each line (usually three per line). This reflects what is most likely the original metre of ancient Hebrew psalmody, as best as can be reconstructed today. The resultant rhythm suffuses the psalms with emotive force even where the actual translation is not literally great. I confess that I miss the Anglican scripture readings and the more complete recitation of the psalter, but the daily provision of hymns and intercessions are what makes the Divine Office really shine. Of course, one could pray the Anglican offices with a hymn book and prepare great intercessions, but that would require preparation, and a good office book should be one we can simply open and pray (as Cranmer, I’m sure, would agree). Still, when someone new joins us for prayer, suddenly we have it hard to explain how the thick book with six coloured ribbons (some of which are the same colour!) and three separate paginations (numbers alone, numbers in brackets and numbers with a star!) works. On a Tuesday in Ordinary Time two ribbons suffice, but come a season or a feast day it becomes difficult to remember what each ribbon is marking. Of course, an office like CCP or CW:DP can be baffling to newcomers too, but I do not think the complexity reaches the level to which it is possible in the Roman Office. Worst of all, while at Walsingham with pilgrims trying to grapple with Evening Prayer from the Roman Office, a grumpy priest-officiant halted us mid-psalm to rant instructions. The Divine Office, in its present form, was first published in 1974, and, although having been lightly revised since, shows its age. Inclusive language sees not even a glimmer, and we repeatedly have to rephrase the constant references to ‘man’ and ‘men’ in the intercessions to something more acceptable. Recently, Candlemas focussed entirely on Simeon, not mentioning Anna once. However, a surprising opposite comes in the translation of the Magnificat: “My soul glorifies the Lord,/ my spirit rejoices in God, my Saviour./ He looks on his servant in her lowliness;/ henceforth all ages will call me blessed.” Praying this canticle every evening, I realised just how much I had identified myself in the words until this feminine phrasing resolutely re-established Mary as the voice (yes, we do have ‘hand-maiden’ in old translations, but the simple ‘her’ here seems to be more powerful in its subtlety). Printed by Collins, The Divine Office is not as beautiful a work of typography as Roman missals are (which I admire if only for their print quality). There are a few typos, but most annoying are the intrusive page breaks in the middle of psalm verses. In this matter, Common Worship is a paragon of clarity in its typesetting. Ultimately, prayer has to be something somewhat personal — one heart’s cry to the divine. Liturgy is the work of marshalling our prayers into corporate worship, yet the daily offices are liturgy that touches most on the personal. Thus, you and I must surely differ on how best we should employ our rich tradition of daily prayer. For evangelicals and less-liturgical Protestants, a quiet time or group extempore prayer will be employed, but Catholics (of both the Roman and Anglican kind) will probably be reading a lot more scripture than they, and, more importantly, when we pray we do so in union with many others across time and space. Gareth, it’s probably fair to mention that the full Breviary provision includes an office of readings which has longer readings from scripture alongside readings (mainly) from the fathers. Thanks for pointing that out, Doug. I had planned to mention the Office of Readings, which I have used on occasion before, but am not using regularly now, but that train of thought got lost. As a parish it is still an investment to have enough copies of the single-volume Daily Prayer, abridged from the three-volume master work. I have enjoyed the very different feel of the Office of Readings in the past, but I think it would be a lot like my work nowadays. How does your experience of praying the office compare with mine, and which elements matter most to you? I think CW / CCP works better corporately. I do, however, take one leaf from the Roman experience and group OT or NT canticle with the psalms, then having the readings without interruption other than silence, before heading into gospel canticle and prayers. Apart from the gender issues, I like the way Rome provides variety of short intercessions for each day of the cycle. I’d really love to be a part of community where I can get responses from other knowledgeable individuals that share the same interest. If you have any suggestions, please let me know. as soon as I started reading the initial paragraph, I thought this just destined to be another boring post. have experienced before. Thank you!